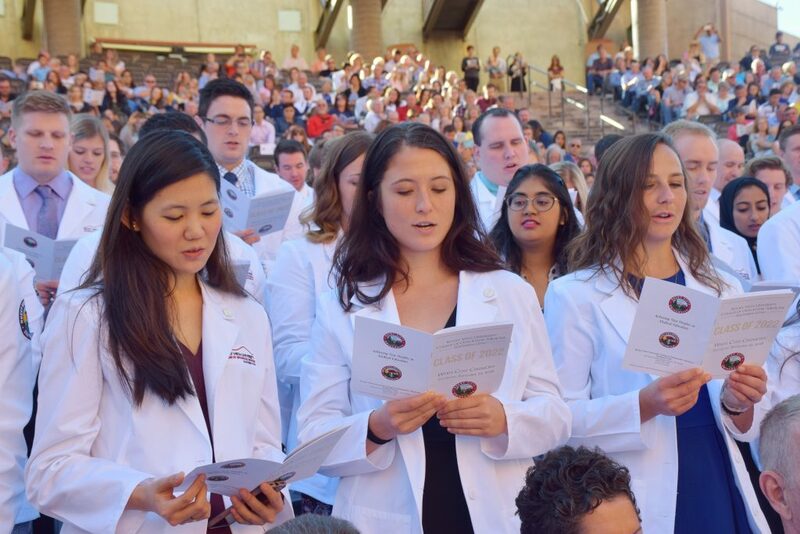 Rocky Vista University College of Osteopathic Medicine – Southern Utah (RVUCOM-SU) held its White Coat Ceremony at the Tuacahn Center for the Arts in Ivins, Utah on September 22nd. Approximately 1,000 were in attendance or participating in this annual event. The White Coat Ceremony is a medical school tradition that welcomes new students into the medical profession. Keynote speaker Donna Milavetz, MD, MPH, FACP, addressed the students about the importance of practicing self-care and being a compassionate physician. Dr. Milavetz is the Chief Executive Officer and Chief Medical Officer of OnSite Care Clinics who is focused on improving healthcare outcomes by providing high quality primary care services to Utah’s employer based communities. Utah ranks 44th in the nation for primary care physicians, with 58.4 active primary care physicians per 100,000 people. The ceremony was emceed by David J. 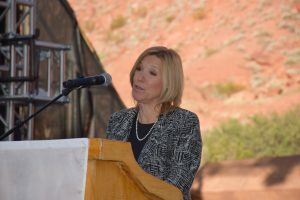 Park, DO, FAAFP, FACOFP, Vice President and Dean for the Southern Utah Campus. Esteemed speakers included Clinton E. Adams, DO, FACHE, President and Chief Executive Officer of RVU; Maha Sallam, PhD, Chair of RVU’s Board of Trustees; Chris Hart, Mayor of Ivins; and Representative Chris Stewart, U.S. Congressman for Utah’s 2nd District. The Class of 2022 is comprised of 128 students from 30 different states and representing 65 different universities and colleges. Forty-four percent of the students were from Utah. These elite students were selected from a competitive applicant pool of 2,094 candidates. The class is made up of 69% males and 31% females with ages ranging from 21 to 38 years old. The mean MCAT score was 505.8, and the average cumulative GPA for the class was 3.59. In keeping with RVU’s continued support of military students, 7% of the incoming class are attending on the Armed Forces Health Professions Scholarship Program. To view photos from the event, visit RVU’s Facebook page at https://bit.ly/2RiKkaW. To read more, visit the Fightin’ Prairie Dog Blog at https://bit.ly/2DVIA4R.